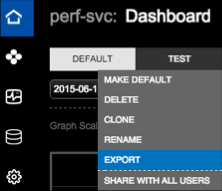 Export dashboard configurations to conveniently import into other clusters or other OpsCenter instances. The dashboard configuration exports and imports as a JSON file. Go to the Dashboard tab that you want to export. Hover on the preset tab and click the drop-down arrow to open the menu. Click Export from the preset menu. The dashboard preset .json file downloads to your computer. 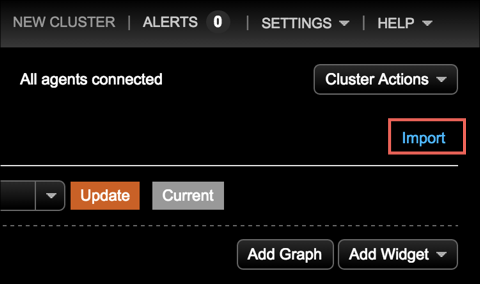 Go to the cluster or instance into which you want to import the presets. Click the Import link on the Dashboard. The Import Dashboard Preset dialog appears. Click Choose File and select the exported .json file. The dashboard preset is imported into its new location.